Meji Maguro (AKA: Meji) caught in fixed net fishing is one type of sushi topping that you really should try. 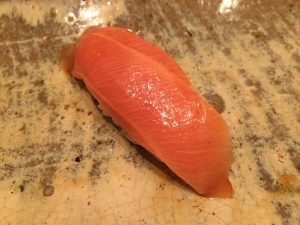 Meji is the larval fish of Pacific bluefin tuna, made and served at expensive restaurants, but not usually available as Edo-style sushi. Its fat is lighter and it doesn’t have the impact that fatty tuna has. Efforts are put into seasoning to avoid this. Using a pinch of ginger, Japanese basil or onion between the topping and rice, along with the wasabi, really brings out the fresh flavor of the young fish as well as the sweetness of this fatty part. Why doesn’t rice stick to the sushi chef’s hands? One of the pleasures of sitting at a sushi counter is watching the sushi master work his craft. He holds the topping between the index finger and thumb of his left hand while simultaneously grabbing the shari (vinegar rice) with his left hand. He gently squeezes the shari and then moves the topping from his left hand to the top of that shari in a fluid motion. This entire process of shaping the shari to the finished piece of sushi takes less than six seconds. Every movement is precise and purposeful. However, no matter how many pieces the chef makes one after another, you’ll never see a grain of rice stick to his hands. If you or I were to make even one piece of sushi, our hands would be covered in rice. So why doesn’t it happen to them? Their hands don’t look oiled. Perhaps sushi chefs have especially smooth or slick hands compared to us average Joes? Of course not. This is actually thanks to the vinegar. The chefs keep a bowl of vinegar close by, which they constantly use to wet their hands. This procedure is called “Tezu” or vinegared water, which both disinfects the hands and cools their palms. When the vinegar evaporates, it takes the heat from the hands with it. Normally hands reach temperatures of 33-34 degrees Celsius (91-93 degrees Fahrenheit), but sushi chefs cool their hands to approximately 30 degrees Celsius (86 F). This transfers the heat from the hands to the shari, keeping it from getting sticky. In other words, not a single grain of rice sticks to their hands. Posted on March 19, 2018 September 11, 2018 Categories TriviaTags Edomae Shigoto, Edomaesushi, Nigiri sushi, Shari, Sukiyabashijiro, vinegared riceLeave a comment on Why doesn’t rice stick to the sushi chef’s hands? Why is freshly-caught fish allowed to age? The most delicious time to eat fish differs depending on if it is served as sashimi, as sushi, or boiled. Fresh does not necessarily mean delicious. For example, Japanese Amberjack should be used in sashimi 3-5 days after being caught, in sushi a week after being caught and it can be used in a stew or boiled once it turns black around the edges. 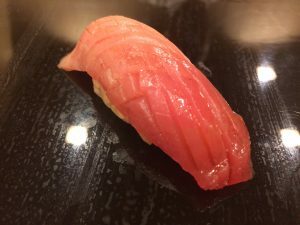 This is because the inosine acid, which is responsible for the umami taste, increases after rigor mortis ends and understanding the timing of the peak in flavor is up to the skill of the sushi chef. 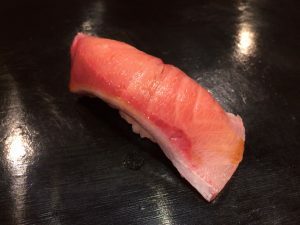 Posted on March 12, 2018 September 11, 2018 Categories Basic KnowledgeTags Edomae Shigoto, Edomaesushi, Inosinic acid, Nigiri sushi, Sushi Ingredients, UmamiLeave a comment on Why is freshly-caught fish allowed to age? Why does the bill more when ordering sashimi at a prestigious restaurant? Thicker cuts of fish are used for sashimi than for sushi. Depending on the restaurant, the equivalent of three pieces of sushi may be used in one cut of sashimi. In other words, two pieces of sashimi is the same as six pieces of sushi. At a restaurant where one piece of medium fatty tuna sushi is priced at JPY 1000, simple arithmetic prices medium fatty tuna sashimi at JPY 6000. Just a small order of assorted sashimi often costs more than JPY 10,000. Be careful. 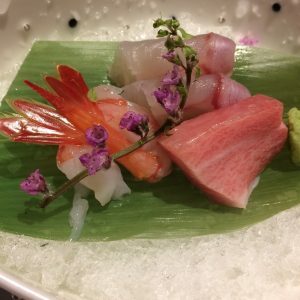 Posted on March 5, 2018 September 11, 2018 Categories TriviaTags Edomaesushi, Nigiri sushi, Sushi IngredientsLeave a comment on Why does the bill more when ordering sashimi at a prestigious restaurant?